To Sum It Up: Tess is a frequent visitor to Dragonswood, the territory sanctioned to the mythical creatures of Wilde Island. Wanting to escape her father's rage, Tess seeks refuge in the forested depths, finding comfort in the beauty of the woods and watching the dragons and fairies from afar. The only problem is that Dragonswood is forbidden; people found in the woods are labeled as demons or witches. This doesn't stop Tess, though. She has an undeniable connection to Dragonswood, and she can't help being drawn there. When a bloodthirsty witch hunter comes to Tess's village, word of Tess's illicit travels to Dragonswood begins to spread. Condemned, Tess is forced to go on the run with her two closest friends. The hunt is on, and only with the help of the mysterious Garth Huntsman, a warden of Dragonswood, do Tess and her friends escape. Even now, after all the trouble Dragonswood has caused her, Tess can't help but be lured deeper within it. Review: Just like Tess, I, too, was lured to Dragonswood because of its charming beauty. I fell in love with the pretty, mystical cover at once. I hate to say it, but the cover and the title heavily influenced me to pick up the book, and looking back now, I wish I would have read the synopsis before I blindly snatched up the book. 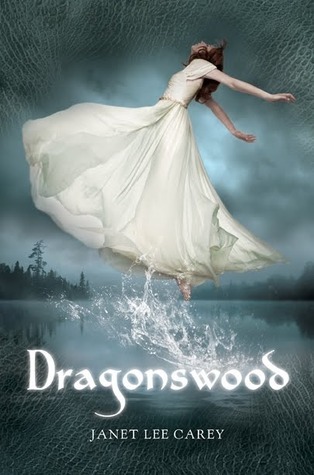 Dragonswood was a decent read; I guess I just had a hard time getting into it. A few different things bothered me about this book, the first being the setup of the story. I was completely lost going into the book and was still confused by the time I finished it. I really wish that there would have been an explanation of the world in the first couple of chapters. From what I've gathered, Dragonswood was a mix of fantasy and history. The Holy Wars, Europe, and Prince John are mentioned more than once throughout the book. Then, on the other hand, you have Wilde Island just off the cost of Great Britain, home of dragons, fairies, and humans, held by the legendary royal Pendragons. It just felt really bizarre. The book felt like it was being pulled in two very different directions, and it just wasn't working for me. If the fantasy and history had been more neatly stitched together, this would have been an imaginative idea. Another problem I had with Dragonswood was relating to the characters. I could not for the life of me connect with any of them. I associated more with the dragons, whom I adored, than with Tess or Garth. Tess, to me, was not a strong protagonist. She ratted out her friends as being witches just after a few minutes of torture. I know, you must be shaking your head and saying, “Ally, come on, she was tortured, can you really blame her?” And I say yes! Yes, I can blame her! She ruined her friends’ lives, forcing them to leave behind their families for a life on the run! And even when Tess did look like she was finally going to be strong and armor herself in my high expectations, she went ahead and made a silly mistake, making things ten times worse. Garth Huntsman was no better. This mysterious “huntsman” was a major letdown in the story. Garth is supposed to be uber sketchy, but, obviously, Tess is bonkers for him and cannot see him doing any wrong. I, being a hopeless romantic myself, had no problems with this; my problem was with the mystery part. There was no mystery! I felt like I figured things out way too easily. Garth's mysterious side was the backbone of the story! It seemed as though little, secretive Garth was hiding in this little shallow puddle. All I had to do was reach in, pluck mysterious Garth out, shake him dry, and voilà, I figured the whole thing out! Yet another thing that bugged me about Dragonswood was the storyline. There could have been a beautifully simple storyline, which would have been perfect, but instead there were whiplash turns and unnecessary drops. The first half of the book was all right. I got it without too much confusion, but by the second half of the book I was feeling extremely dizzy and lost. I think it was the fairies that did it in for me. I felt like they were shoved into the story with a lame excuse. The fairies annoyed me to no end. But, hey, that's just me and how I felt. Well, I feel as though I've ranted and raved like a lunatic, and I don't want to come off that way. I certainly don't want to put anybody off of reading Dragonswood. It was an okay book in the end, and I really did enjoy some things in the book. I love, loved the dragons. I loved their story and history. Carey describes the dragons beautifully, masterly bringing them to life. They were really wise and brave; they were the glue that held this book together. The dragons could talk and often put their two cents in where they were much needed. In the end, Dragonswood had so much potential! A few things did bug me throughout the book, while other aspects were highly entertaining and easily loveable. I guess you can say I have mixed feelings about this book. All in All: Although Dragonswood wasn't really my cup of tea, those who have an appetite for dragons, fairies, or plain old heartbreaking romance should definitely check this book out. Yeah, I tell myself that I won't be so rash the next time I see an eye-catching cover but I never learn!